Chase Field (formerly known as Bank One Ballpark) is in downtown Phoenix, less than 15 minutes from Phoenix Sky Harbor International Airport. It is the home of the Arizona Diamondbacks baseball team. Staying in Phoenix just for the game or an event at Chase Field? 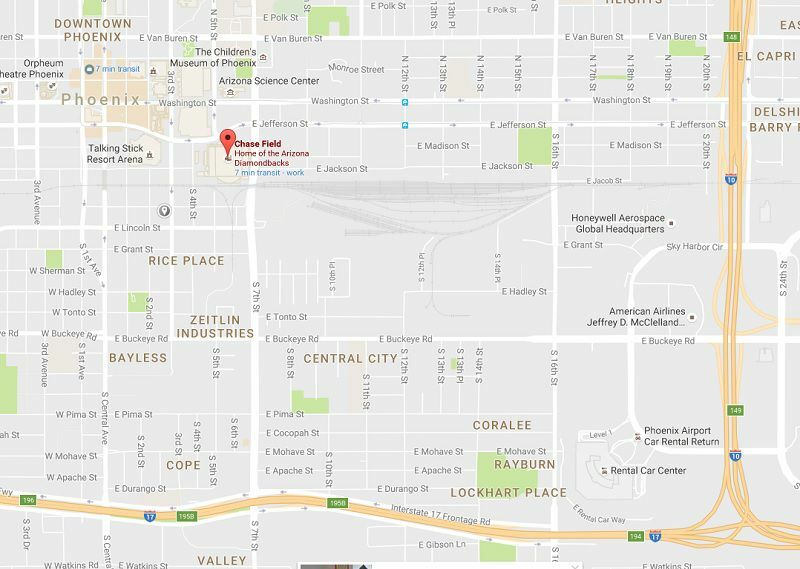 These are recommended hotels located in Downtown Phoenix and you might even be able to walk to the game. Alternatively, try to find a hotel within walking distance of Valley Light Rail. There are plenty of public parking lots, both covered and uncovered around Chase Field. You can expect to pay between $5 and $15 to park for a regular season game, depending on how far you want to walk, and how quickly you want to be able to leave after the end of the game! The Chase Field Parking Garage is just south of the railroad tracks on 4th Street between Jefferson and Lincoln. There is more parking available at Talking Stick Resort Arena parking garage and the City of Phoenix parking garage on 7th Street and Washington Street. If you need to drop someone off at Chase Field, The designated drop-off point is located on the south side of Jefferson Street, just west of 7th Street. This is at the northeast corner of Chase Field near Gate K. The Drop Off is staffed and there are shaded benches available for guests who need to wait for someone or to be picked up after the game. The Box Office for Chase Field is at the same location, on the main Plaza. Chase Field is in in downtown Phoenix, between 4th Street and 7th Street, Jefferson Street and the Southern Pacific Railroad tracks to the south. From the Southeast: Take I-10 to I-17 at the first split and exit on 7th St. Turn left at the light at Lincoln St., or continue north on 7th St. to Jefferson St. and turn right to access parking facilities east of 7th St.
From the West: Take I-10 to 7th Ave. or the 5th Ave. HOV exit, then turn right. Turn left on Fillmore, Van Buren St. (accessible from 5th Ave. only) or Jefferson St.
From the Northwest: Take I-17 to the Jefferson St. exit, then turn left and continue eastbound. From the Northeast Valley: Take SR 51 to I-10 eastbound, exit at Washington St. and turn right, or take I-10 westbound to the 7th St. exit and turn left. From Scottsdale or East Mesa: Take Loop 202 west to I-10 and exit at 7th Ave. or the 5th Ave. HOV exit. Turn left on Fillmore, Van Buren St. (accessible from 5th Ave. only) or Jefferson St.
By Valley Metro Rail: Use the 3rd Street and Washington or 3rd Street and Jefferson station.This is a split station, so which station you use depends on the direction in which you are traveling. See a map showing the Downtown Phoenix light rail stations. You can see Chase Field marked on a Google map. From there you can zoom in and out, get driving directions if you need more specifics than mentioned above, and see what else is nearby. The Arizona Diamondbacks MLB Baseball Club plays at Chase Field. The stadium is home to other events from time to time, including concerts and special exhibitions. The stadium seats just under 50,000 people -- it's a big place, and the seats in the upper deck are pretty far away from the action! My favorite sections are definitely those in the second level (200s), indicated in blue, above. That is the same as the Suite Level. It is much less crowded than the main concourse, and if you are parking in the connecting garage there is a walkway bridge directly to that level only for people who have tickets there. There's a great bar on that level where you can watch the game as well as whatever other sports are being shown on TV. The seats are roomier and food service is offered right at the seats if you don't want to leave to go to the concession stands. The downside to seats on that level is that the food choices are much more limited at the concessions here. You can always go down to the main concourse for some of the more "interesting" food choices! In this graphic, batters face north. Chase Field is located in Downtown Phoenix, just minutes from Phoenix Sky Harbor International Airport and within walking distance from the Phoenix Convention Center, Talking Stick Resort Arena, and CityScape with an assortment of restaurants, bars and entertainment options. You can get here using Valley Metro Rail. In this photo, the roof is partially open. Chase Field is an exciting stadium, with many features that make seeing a game here a treat. Special seating options including Friday's Front Row (a ballpark version of TGI Friday's), which is open all year long, even when no games are being played. Make sure you take the kids to visit the Sandlot where they can expend some energy and get some mini-batting practice. In Center field, make sure you take notice of the pool -- yes, you can buy tickets for that. The pool fountains spout encouragement whenever when of our guys hits a home run. Chase Field is one of the most cost-friendly stadiums in the country. Check out the various options for all-you-can-eat seats as well as concession value items available to all. The exterior of the Chase Field ballpark has colorful panels that can be opened to allow airflow into the stadium. Chase Field was one of the first ballparks in the nation to be built with a retractable roof. It allows the crew to get natural sunlight to the grass, while allowing the guests at ballgames to enjoy the game in reasonable temperatures (78-80°F). For the summer months, you can expect the roof to be closed for midday games. The roof might be open in the evening, unless they are expecting high nighttime temperatures or a monsoon storm. It only takes about four minutes to close the roof if there is unexpected inclement weather. You can check online to see if the Chase Field roof will be open or closed for the game you'll be attending. In 2016 Chase Field introduced a special section in left field, the PetSmart Patio, where dogs and their owners can enjoy baseball in style. Each area is enclosed and includes treats for the dogs and all-you-can-eat snacks for the humans. There are areas for the dogs to relieve themselves. Special tickets are required for this area. When I visited all the people and dogs were having a great time -- including Zeus, pictured above!